Now If I Had Been Writing this Story. 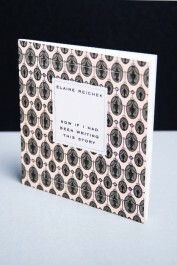 Reichek, Elaine; Secession (hg) Now If I Had Been Writing this Story. For more than four decades, Elaine Reichek has been working on a critical and feminist reading of historical texts and images. The analytical engagement with narratives from myth and literature, and the reflection on their social function as a medium of cultural cohesion, runs through the artists oeuvre like the thread that Ariadne gave to Theseus, so that he would find his way out of the Minotaurs labyrinth. In the last years her works are exploring the figures of the Minoan girls and the stories of lust, seduction, cruelty, and betrayal associated with them: Europa, Pasiphaë, Phaedra, and Ariadne. Although their tragic fates are key to the narratives in which they appear, they are often seen as supporting characters; the heroes are invariably men. Reichek, by contrast, puts the spotlight on the women, examining their complex characters by compiling different interpretations and depictions, and assembling eclectic arrangements of elements from visual art and literature to break through overly narrow constructions: in the artists hands, appropriation becomes a strategy of emancipation. Textile techniques such as embroidery and knitting as well as conceptual methods, photography, and various printing processes have been central to Reicheks practice since the 1970s. Not by accident, what holds her work together on the formal and conceptual levels is the threadin the figurative as well as literal sense: unspooling Ariadnes thread lets her unfold the story of the labyrinth, while the fine thread used in embroidery interweaves images and selected passages of text in scintillating visual compositions. Like a pixel, the stitch is the basic building block of visual transmission in Reicheks work: a pixelated image resembles an embroidery chart, just as the stitches in a hand-sewn embroidery point back to a JPEG trawled from the Internet or scanned from a printed source. Although digital technology has sped up and expanded the possibilities for research, translation and production, Reicheks works remain material objects, rooted in the history of thread as a medium. Elaine Reicheks artist´s book is a decorative archival storage box in the design of the Hamilton Urns - one of the earliest examples of American neo-classical wallpaper models-, that unpacks her exhibition both physically and conceptually. Inside are two different kinds of books: A standard book includes all the works in the exhibition and an essay by the artist. Then, four accordion-style leporellos explore the most recent piece, Toutes les filles (201617), unfolding to reveal each of its 24 motifs and their art-historical sources.